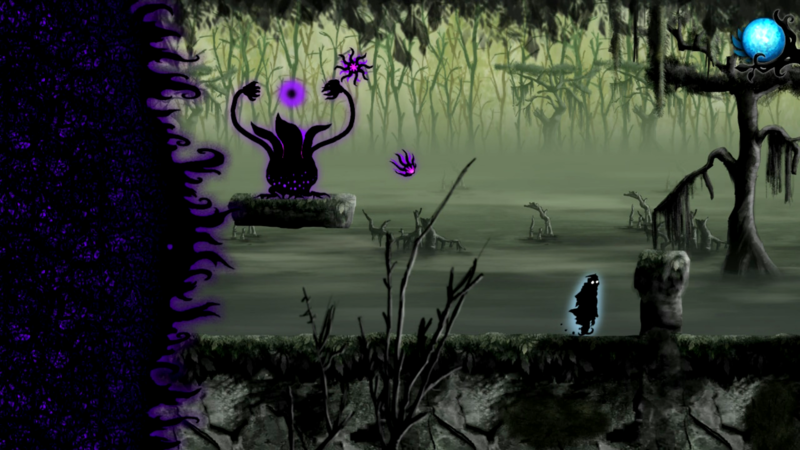 Nihilumbra is a puzzle-platformer game where you control the elements in order to solve puzzles and progress throughout the world…as it’s swallowed up by The Void. 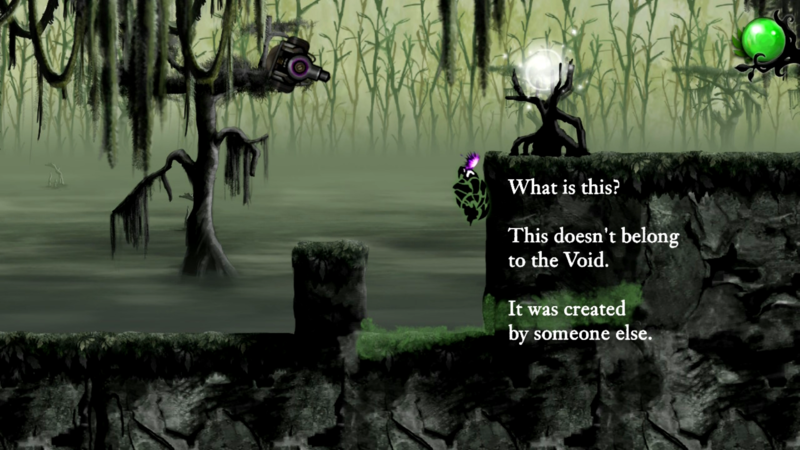 A few years ago I chanced upon Nihilumbra on iOS- a striking purple, black, and white icon, sporting a bizarre name, captured my interest and quickly became one of the favorite games I’d ever experienced on my phone. From the moment I started I was immersed into the fascinating universe BeautiFun Games had created and to this day Nihilumbra remains dear to me for giving me such a unique experience. Amongst a market saturated with repetitive copycat games, absurdly low price tags, and obnoxiously bright cartoony style graphics, Nihilumbra had the odds stacked against it- yet scored strongly on most platforms it graced. Since discovering Nihilumbra on iOS I’ve gone back many times not just by playing it, but purchasing the OST, using the wallpapers for my desktop, creating fanart, and recommending it in conversations about smaller or unique games (I even mentioned it in my last review). 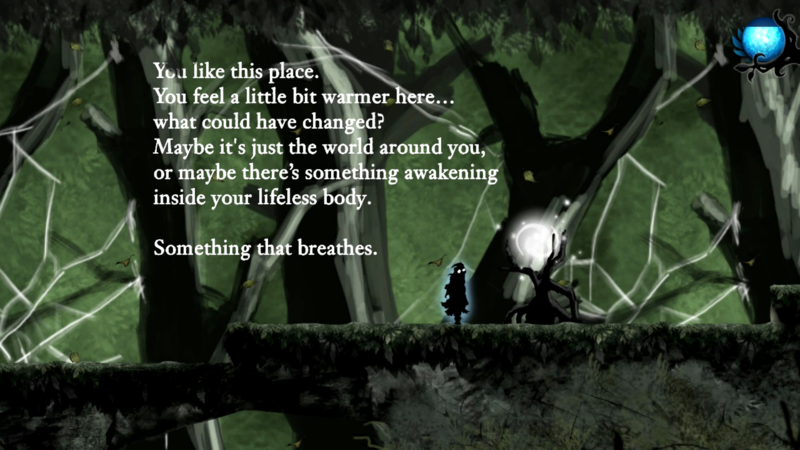 For everything it was, Nihilumbra on mobile was absolutely astonishing- the artwork, the animation, the music, the controls, the movement, and the concept. When it came to Wii U I was shocked but proud, a part of me doubted it would be as good as I remembered it, as so much of the praise I had was in the context of it being a mobile game, but Nihilumbra proved me wrong and fit perfectly onto the Wii U’s hardware. Nihilumbra is, by no means, the greatest game ever created and dripping with raw perfection, were it marketed as a AAA title and cost $60 a lot of questions would probably be raised- but it is a perfect example of an indie game. A core theme unfolds into brilliant mechanics that guide you through a unique (but not too complex) and fascinating world decorated with wonderful designs and beautiful music. The concept of a void, or what it means to exist, controlling the elements, puzzle-platforming, or even the literal black blob your character is- none of these are particularly unique in any media format, but the way Nihilumbra does it is so wonderfully crafted and unique to itself I can honestly say I’ve never seen anything quite like it; and that’s a fantastic way to create your media in a time where originality feels so hard to come by. The art style is what drew me in first. Dropped into a cold yet familiar world your character was somehow separated from The Void, which will destroy anywhere you run to become one with you again. The Void and that which comes from it appear as black and purple shapes defined by their silhouette in contrast to the softer natural world around them. Every location is distinct and for the most part the visuals do their intended purpose, the occasional object making it unclear as to how to interact with it. Backgrounds and objects can look a little sloppy at times with how they’re drawn, and a few enemies seem to exist physically beyond what their sprite is telling the player which can feel frustrating. Certain abilities could do with standing out slightly more too as not seeing where you’ve painted can interrupt gameplay. Overall though the visuals are strong and it’s easy to quickly distinguish what’s important for progressing. The monster designs are wonderful in both how they appear and how they move. Animations are incredibly fluid and the variety of interactions you can experience within Nihilumbra have a great amount of care and detail poured into them. The user interface is so simple but so efficient and allows players to experience the game with minimal interruptions from it. 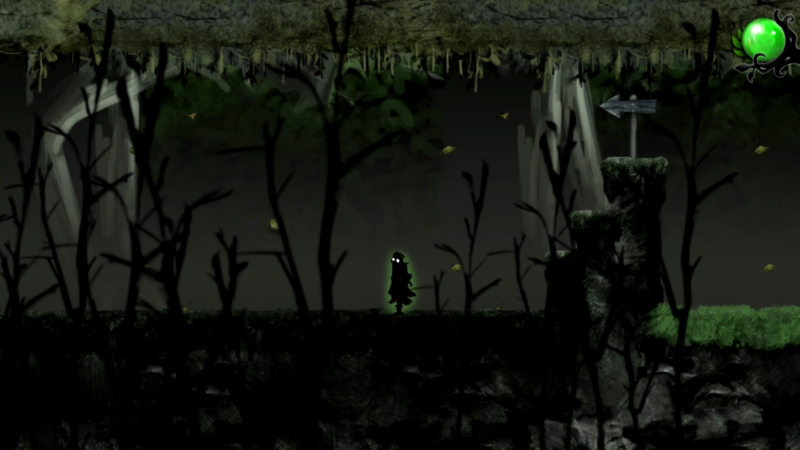 The music in Nihilumbra is soaked with atmosphere; songs are thick with dread and even the softer, lighter sounds portray an unwelcoming tone that fits perfectly with the theme of the game. Nihilumbra (main theme), Frozen Cliffs, and Living Forest for example exude a desolate tranquility that captures my attention to remind me what is happening; Born is a small, simple creature just trying to survive yet the world around him is being consumed by terrible things. The background tones are deeper, darker, they lurk and taint the purer sounds until it becomes overwhelming; until The Void becomes unignorable. In short, the music in Nihilumbra is beautiful. The sound effects too are bold and creative- gunshots from an unknown weapon, desperate rasps from a Crawlaggar, a hollow rush upon death, an uncomfortable squelch from one of your abilities- none of it feels out of place within the universe and serves to deepen the atmosphere rather than disrupt it. When considering Nihilumbra’s greatest strength my kneejerk reaction is to think it’s the art style, but then I remember how strong the music is…and then I remember how strong the gameplay is. Mechanically it’s simple; left, right, jump, and Colors make up most of what the player will be doing. 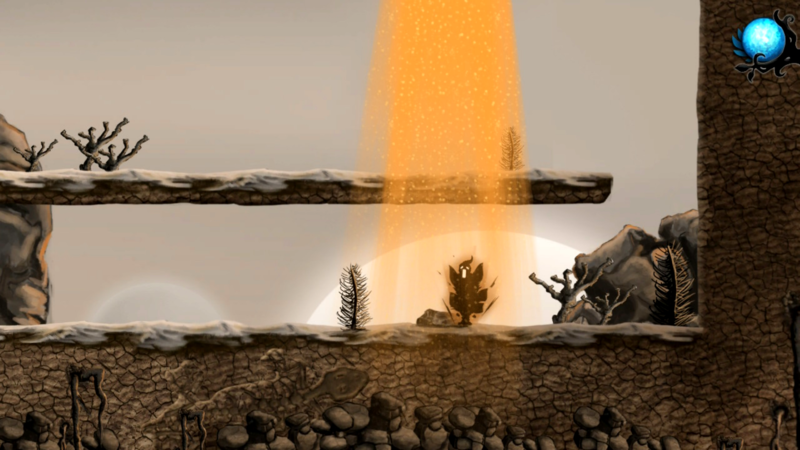 Alongside the platforming element Nihilumbra allows you to actually control certain elements in the form of Colors. Each Color is gained through a tutorial world designed to not let go of you until you’ve demonstrated knowledge of how to utilize your new powers- it’s simple, it’s effective, and it fits in wonderfully with the rest of the game. The simplistic nature of the controls mean nothing too explicit is needed to help the player learn, but there are other options that can streamline your gameplay style if you choose. Now, unfortunately, comes one of my biggest issues with Nihilumbra on Switch. On iOS and Wii U you could use Colors via the touch screen, which worked excellently. When I heard Nihilumbra was coming to Switch I wondered if we’d have a similar situation to Okami on PS2- where the action of drawing shapes to progress in the game would have the option to be done with control pads instead. Unforunately, if a way to use Colors without the touchscreen in Nihilumbra exists I have yet to find it. After minutes of tinkering with every button and stick combo on the Pro controller I simply can’t find a way to use Colors- a compulsory mechanic for progression. It’s a big disappointment to be forced into handheld mode on the Switch, partly because I would have prefered to re-experience Nihilumbra with a larger picture and better sound, and partly because it seems so bizarre to rule out half of the Switch’s entire gimmick, so as of current, it looks like Nihilumbra is only playable beyond the first few minutes during handheld mode. I know from experience the game works downscaled onto a tablet screen, but having the option of using it in both handheld and docked mode would have been far better, especially as the Switch doesn’t use a stylus like the Wii U did, so bust out those screen cleaners in advance because there’s a lot of smearing to do in this game. Back to gameplay features, many of the puzzles in Nihilumbra can be done in multiple ways- most of which aren’t very different, but having the option is pleasant. Every now and then a game makes me feel uncertain as to whether I completed a puzzle genuinely or if I managed to find an exploit because of how loose the mechanics feel, but within Nihilumbra it merely feels like a feature to do things my own way rather than anything else. Similarly, players can use Colors to personalise their experiences or pace things differently. For example; using Blue to move across the game faster, or Green to turn everything into a trampoline. 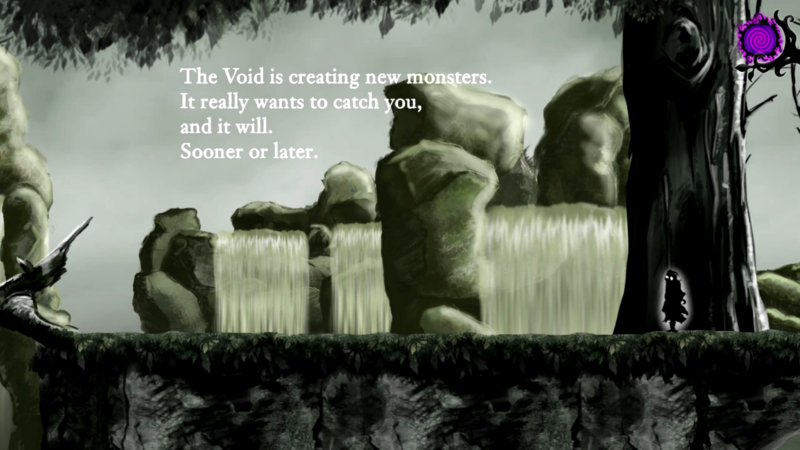 Speaking of pacing, the game is narrated alongside the text that joins you during your adventure- however it’s delivered at a very specific speed that forces you to wait around for it to finish, or simply go on ahead and skip out on certain parts of the communication. It’s not crucial to read or hear the dialogue and it fades out when you interrupt it rather than horrible sharp cuts, but it still feels awkward that such a strong tool disallows the player from experiencing the game in a certain way. Some final notes; there are some parts of Nihilumbra where you’re almost always forced to die as part of the experience, and while the game barely punishes deaths it still can feel a little cheap. Brown still has that weird bug where your sprite doesn’t correspond with the surface it’s on. And there’s some very good replay value for those who have beaten the main campaign. Hello yes 911? It’s happening again. Nihilumbra is beautiful, that much has already been said. Years later I still adore this game and I’m very happy to be experiencing it again. I put the soundtrack back on while I was writing this just to feel immersed in the wonderful music, and I will undoubtably replay it while travelling with my Switch. I hope it brings similarly wonderful experiences to players that it has brought for me. Nihilumbra is out on Switch May 3rd. Thank you very much to BeautiFun Games for providing me with this review copy, and if you have any questions or comments you can leave them below, or send me them on Twitter. Thank you for reading.